General view of the Zanjiri Masjid, also known as Malikah Jahan Begam's Mosque, Bijapur. bl.uk > Online Gallery Home	> Online exhibitions	> Asia, Pacific and Africa Collections	> General view of the Zanjiri Masjid, also known as Malikah Jahan Begam's Mosque, Bijapur. 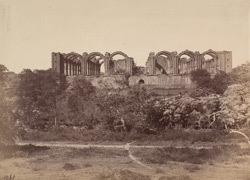 Photograph of Malika Jahan Begam's Mosque, Bijapur from the Archaeological Survey of India Collections taken by Henry Cousens in the 1880s. The mosque, situated among trees immediately to the west of the Sat Manzili, is known locally as the Zanjiri Masjid and was built by Ibrahim Adil Shah II (r.1580-167) in honour of his wife. It was once decorated with ornate stone motifs including the hanging chain details that earned the building its name these however were lost as the building was being restored.